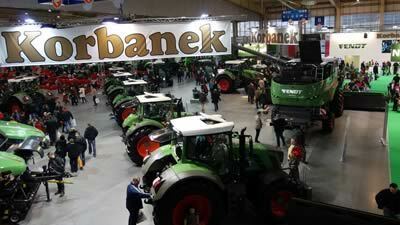 The Polagra-Premiery, the most important indoor exhibition for agricultural equipment in Poland, is held biannually in Posen. The exhibition is seminal for all of Central and Eastern Europe, since it is the first to show all of the technical innovations for the coming year. More than 360 exhibitors presented over 400 different brands for the area of agricultural engineering and farming on more than 50,000 sqm at the end of January. As the official importer for Fendt in Poland, the company Korbanek presented the entire product line, from tractors to combines and up to the balers, on a total of 3000 sqm. at Polagra-Premiery. The awarding of the Polagra gold medals for especially innovative products is one of the highlights of the trade fair, not least, because these are considered the most important awards for agricultural engineering in Poland. A maximum of 30 medals are awarded out of 500 entries, and handed over to the brand representatives by the Polish Agricultural Minister Stanislaw Kalemba. The Fendt brand won a gold medal for each of two outstanding innovations: the Fendt 9490X hybrid combine and the new Fendt 800 Vario series, which complies with EU stage 4 /Tier 4 Final emissions standards. The superior technology of the vehicle in combination with many innovative detail solutions, such as the VarioGrip tyre pressure regulation system, the VarioGuide automated steering system and the most efficient engine technology with double turbocharging and SCR exhaust technology, completely convinced the jury and was worth a gold medal.